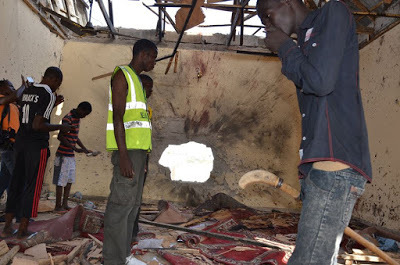 BY NDAHI MARAMA, MAIDUGURI Twin Suicide Bombers have sneaked into the University of Maiduguri, Borno state, and detonated heavy explosives at a mosque near Gate 4 and 5 of the institution. This incident is coming at a time where students were writing their end of first semester exams. Sources said the incident took place at about 5:35am when Muslim Ummah were performing their morning prayers. “There was twin suicide attacks in a mosque situated close to professors quarters, north of the University of Maiduguri this morning, scores were killed including two professors, students and staff”. The source said. A resident of the institution who simply gave his name as Mallam Umar Ibrahim in an interview said. “The two female suicide bombers entered the varsity through Gates 4 and 5. The explosives went up and hit two mosques at 5.15am and 5.35am simultaniously on Monday”. Already the Public Relations Officer of the Institution, Mallam Ahmed Mohammed confirmed the suicide attacks in the University, but said, he did not have further details as to whether there is casualty. Details later please.